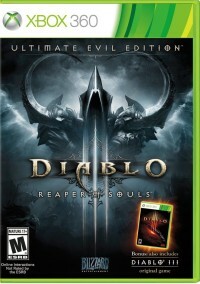 Blizzard is celebrating two years since the release of the Reaper of Souls Diablo III expansion. That massive boost to the game was released on March 25, 2014. In honor of the second anniversary, a giveaway is offering the chance to win some great Diablo-themed merchandise. Enter the contest by April 4 for a shot at winning. Entering is as easy as identifying a Legendary—just click the button below for your chance at this sweet, sweet loot! All participants will also receive a code for 20% off your next purchase of Diablo products (excluding Artist Proof Diablo Statue) on the Blizzard Gear store! Terms and conditions apply. For more information, including the official rules and to enter, click here. 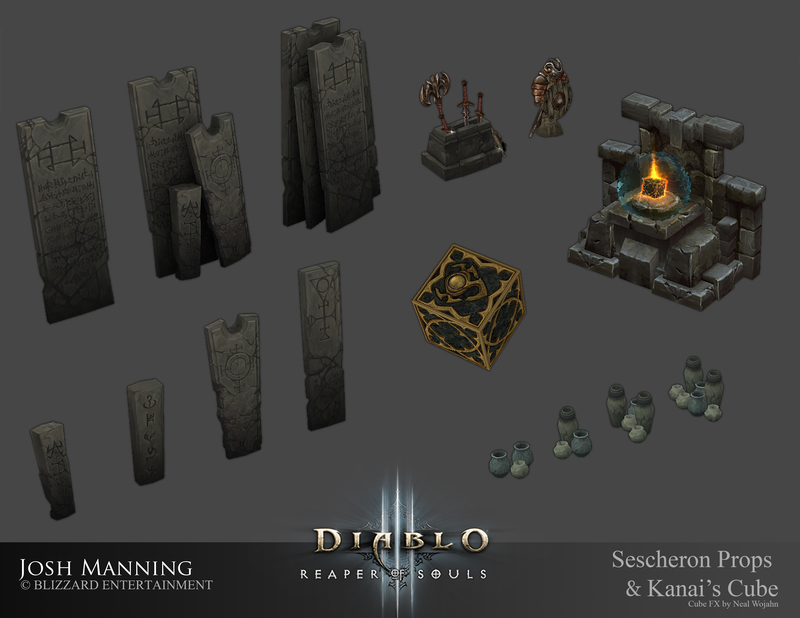 Read on for a retrospective of the massive amount of art that went into the Reaper of Souls expansion. 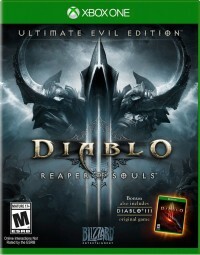 Reaper of Souls was released on March 25, 2014 and changed the face of Diablo III. At the root of the new Act V and Adventure Mode content and Loot 2.0 revision was a lot of passion, creativity, and gorgeous art. 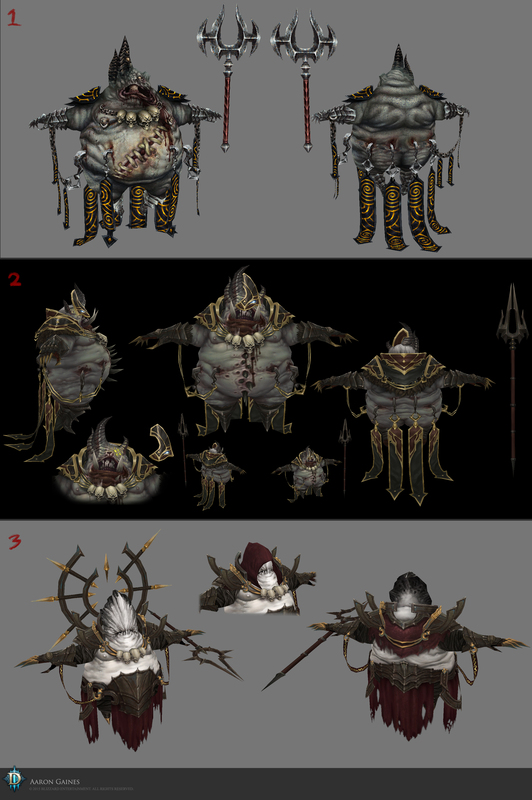 In celebration, members of the DIablo III Art team put together an in-depth look at some of the early (and completed!) works that paved the way to building the award-winning expansion we shared just over two years ago. While areas as large as zones are bound to be similarly collaborative, some individual elements might be owned from inception to delivery. 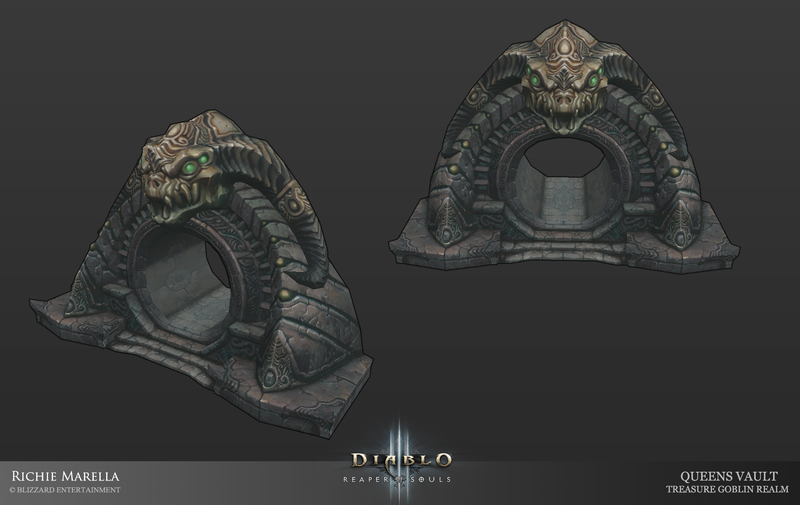 Senior 3D Artist Richie Marella, for example, led the charge on many of the iconic pieces that make up Greed’s Realm, the home of the Treasure Goblins. Richie: With the vastness of the cave system that holds the sea of treasures we really wanted to convey the epic size of Greed's Realm. So I created this system of rock formations that elevated the player so they can witness the majesty of this place. 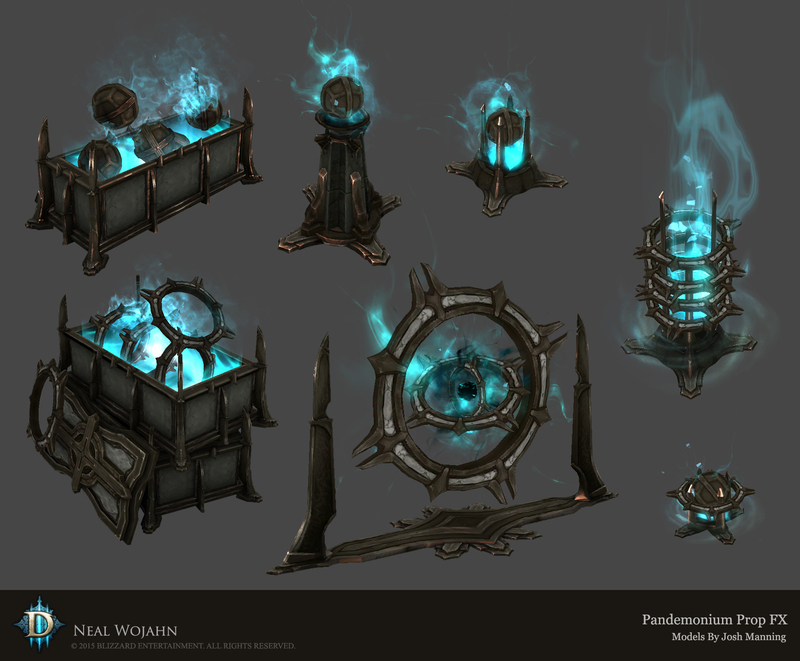 This area was one of my favorite places to work on because I was able to use new ways of creating assets as well as the tried and true 2.5D methods that are at the core of Diablo III's signature look. The small and often overlooked details help breathe life into an area. Artists like Josh Manning and Neal Wojahn work on the props, set pieces, and effects that make Sanctuary feel alive, inhabited, and interactive. Their influence can be found throughout Sanctuary. Josh: I spend the majority of my time working on props and breakables. I had these rad concepts to work from that Mike Franchina made of old and ruined barb stuff. 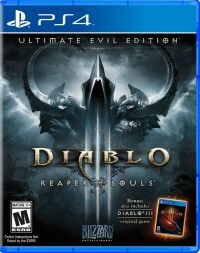 I’ve had a good amount of freedom as well to make changes and add my own touches as a long time Diablo player and fan. The grave marker second from the left on the bottom is actually the Diablo II Runeword for “indestructible,” and as such, doesn’t actually break when you hit it! 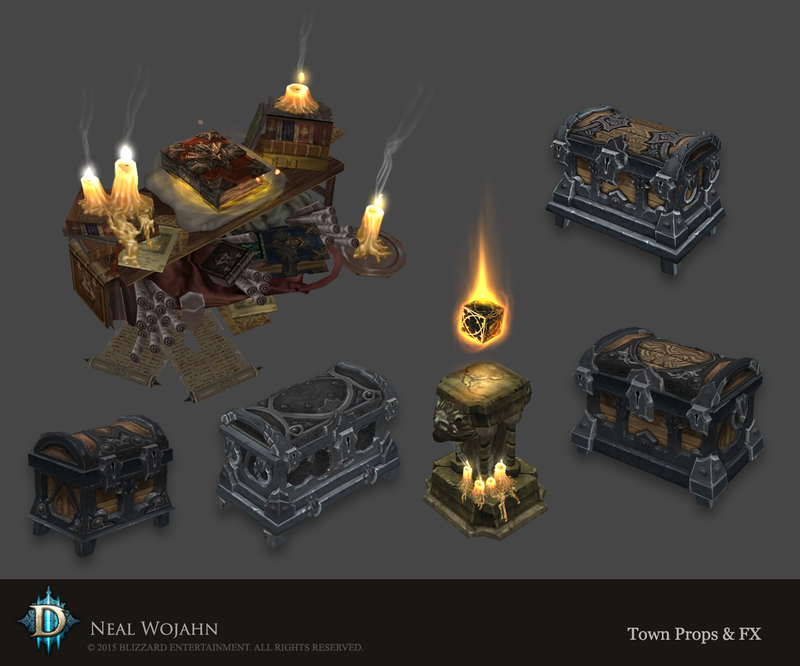 Neal: I got to do a lot of the props and FX for New Tristram. I love to infuse story into all of my art and I thought of the Book of Cain table as almost a sort of traveling memorial that the artisans had taken with them from town to town. Many of his belongings are littered around it. I also really enjoyed animating the pages turning! Neal: Greyhollow Island is set in a treacherous area constantly assaulted by the weather. A player would have to stop on an outcropping to look for it, but the entire background is undulating with giant waves. It’s easy to miss, but that effect was one of the hardest things I made, and I’m really happy with how it turned out. I was born and raised in the Pacific Northwest, and Greyhollow Island was my chance to pull a lot of inspiration from my homeland. With so many beautiful (and/or terrifying) places in Sanctuary to explore, each area needed appropriate inhabitants. 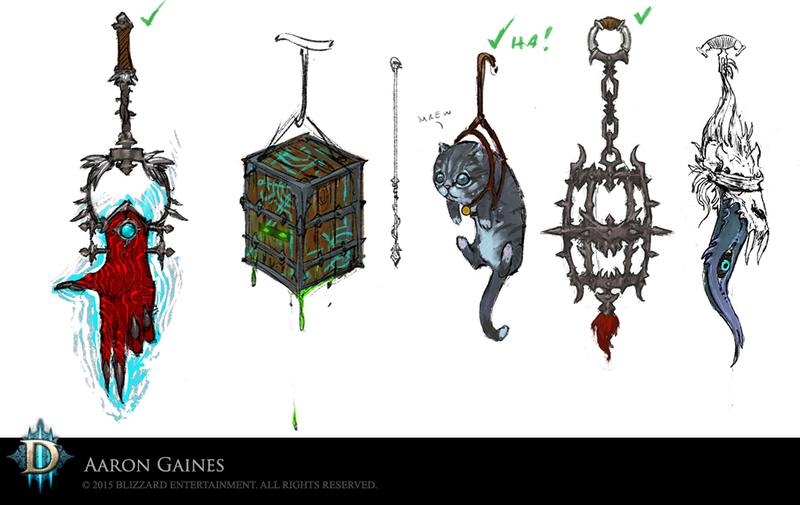 Senior Artist Aaron Gaines joined the Diablo team early on, though some of his first concepts didn’t appear in-game until Reaper of Souls. Aaron: This guy was a huge moment for me sentimentally. 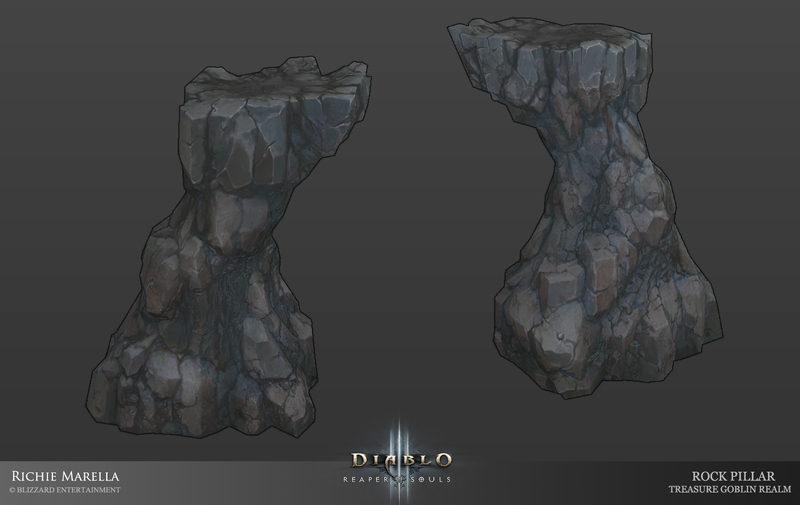 The top one is my actual Art Test for Blizzard—it's what got me the interview to work on Diablo. 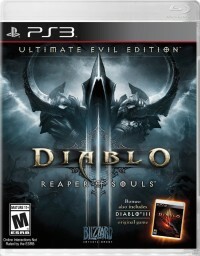 After Diablo III shipped, I looked back (as many of us do) at my old work and saw something that needed improvement. So I used what I'd learned over the project and revisited him as an exercise. When Reaper of Souls came into production, I was able to convince people he was cool and turn him into an actual monster. He’s definitely been through a lot and is still one of my favorites. Not everything goes as planned throughout the process of ideation, where a concept is iterated on again and again to ensure it meets the needs of the game. 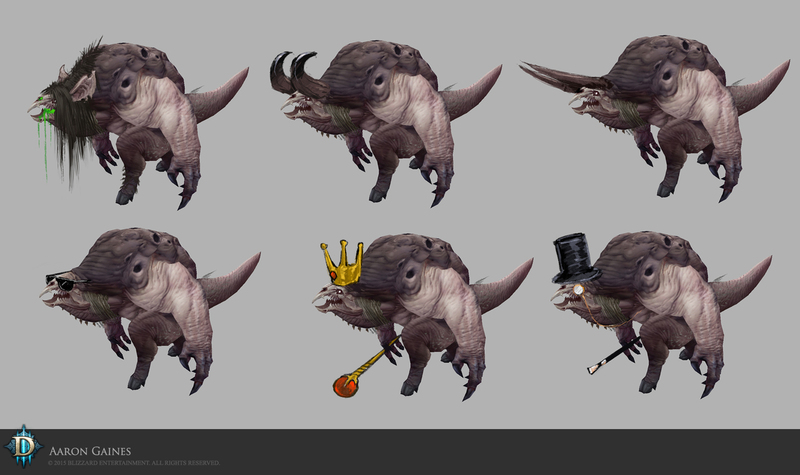 The Rat King is a great example of needing to meet demands outside of just art guidelines and tweaking the details until a concept works for all disciplines (and having a little fun in the process). Aaron: Often when we come up with an idea for a monster, it’s going to change due to any number of factors. 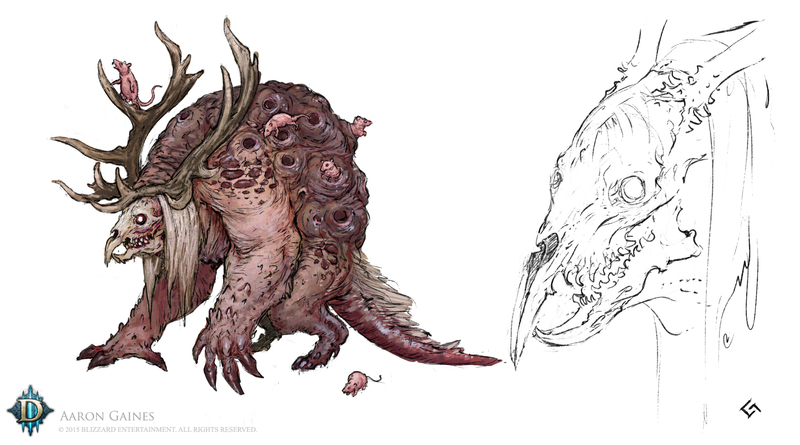 The Rat King’s powers, for instance, changed so he had a burrow and the antlers were no longer viable. So we turned him into two monsters, one that burrowed and one that didn’t. Got to keep the antlers and got to do some exploration for a new version. Win/win. But Sanctuary is filled with more than just monsters. Somehow, people have also found a way to survive despite all the threats to civilization. 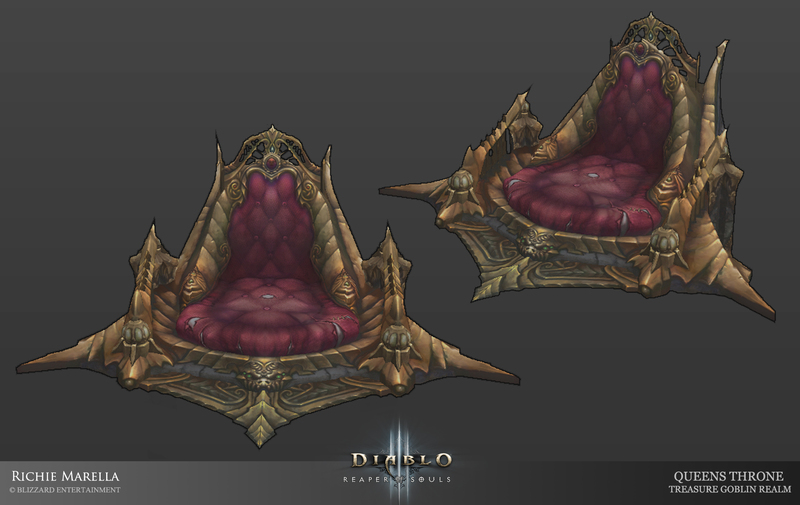 Paul: This was a model we put together for the announcement of Diablo III. We originally had the idea of having large resolution characters come up on screen whenever the player would have a conversation with an NPC. The feature didn't make it into the game, but this remains one of my favorite art pieces. Itemization is a huge part of Diablo, and art and design work in tandem when putting together the Legendaries that you know and love. While game design can dictate how an item looks, just as often an idea comes together in an art brainstorm that just has to make it into the game. Aaron: I'm sometimes guilty of having a little fun with ideas just to get a quick laugh in an art review meeting. It worked, they laughed . . . and then someone said, “You know we have to make that now, right?” Paul David ended up making the cat Mojo, and modeling it after his own ridiculously handsome cat Henri. I still can’t believe (and also love) that he made it in. Paul: Every now and then we get the chance to have a bit of silliness in the game. 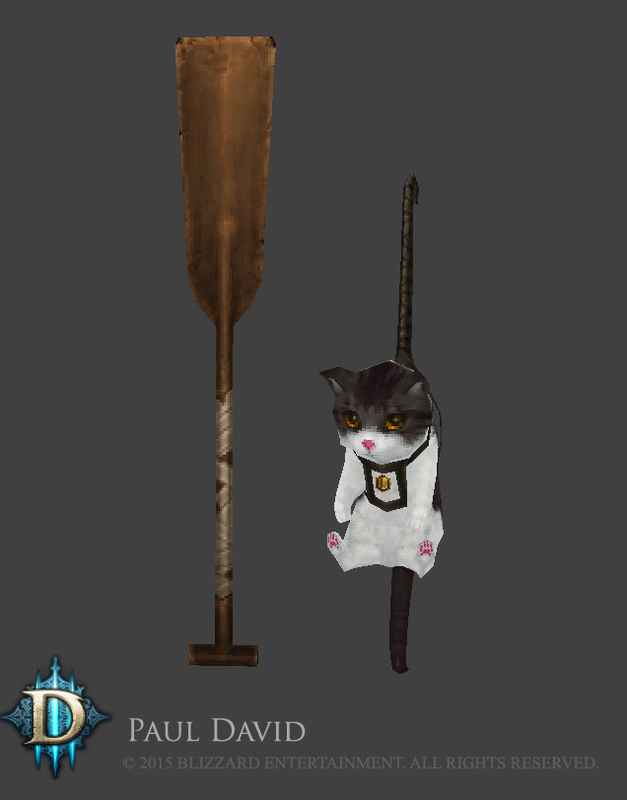 Early on, I was making some early two-handed swords and, for laughs, I decided to throw one in shaped like a paddle. Similarly, Henri's Perquisition is actually modeled (and named) after my darling cat, Henri. Aaron had the idea to create a cat for a mojo . . . and we just sort of took it from there! It’s not all silliness in the art jams, however. Sometimes, it’s an opportunity to let an artist break out from their usual realm of expertise and explore something new. While Josh Manning usually builds props and scenery, he had an opportunity to take his knack for the eerie and apply it to the Spirit of Arachyr set. 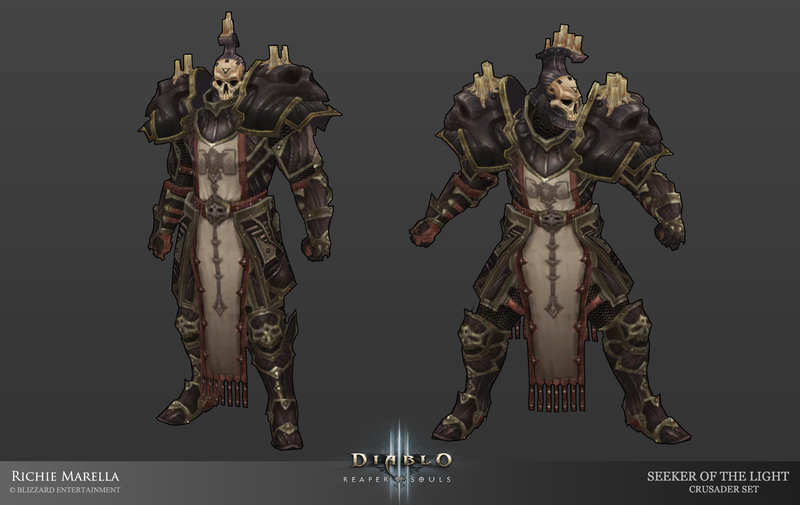 Josh: I’d wanted to make a Diablo III armor set for a long time, and after talking with the character team they were happy to help get me started. It was a totally different experience working on character models vs. my usual prop work, but ultimately, it was a huge learning experience. I also got to animate the set's unique parts. I really wanted to add to the creepy vibe of the new Witch Doctor set . . . and show off the spider egg over his eye. Other times, artists will share concepts they’ve been working on and our 3D artists find themselves inspired to bring the idea to life. Richie: I wanted to do more character work, so when one of our awesome concept artists Mike Franchina concepted this awesome armor set for the Crusader class, I jumped at the chance to create it. Although the set is based on light and holiness, I loved Mike’s twist on the Crusader edict of taking up the master’s armor and name once they fall in battle. His version took that a step further, where the Crusader also takes [their master’s] skull and uses it as the facemask portion of the helm. It was an honor to work on this set and I collected the full set as soon as it came out. Diablo III has evolved so much since its launch and, every once in a while, it’s nice to take a retrospective look on where we’ve been and where we’re going. Reaper of Souls was a monumental accomplishment for our development team, and the hard work and fruitful efforts could not have been accomplished without the dedication of our art team. 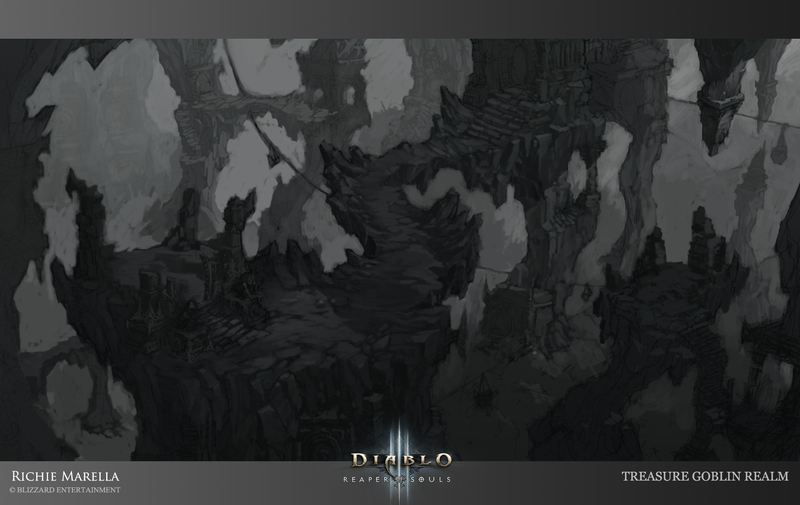 We hope you’ve enjoyed this look into the art of Diablo III. Thanks for an incredible two years, and here’s to many more!